Parents Please Return The Forms! Jumping into fall with our Westheights Kids means re-registering for all our Sunday morning programs! We need up-to-date information on all your precious kiddos…Please stop at the Hub to pick up your Child Info pack. Simply check, complete and return the forms, and hand them back in to the Hub Crew. We will use the information on these forms to make ID cards that will speak for your infant, toddler, or preschooler who may not be able to articulate allergies, special needs or appropriate comfort measures! As well, our director will use the Child Info database to support all of the children who attend as effectively as possible. If you already have the forms at home, fill them out NOW! Get up NOW and go look for them! Fill them out IMMEDIATELY and TAPE them to your DOOR or put them in your PURSE so that there is no way for you to forget them on SUNDAY! 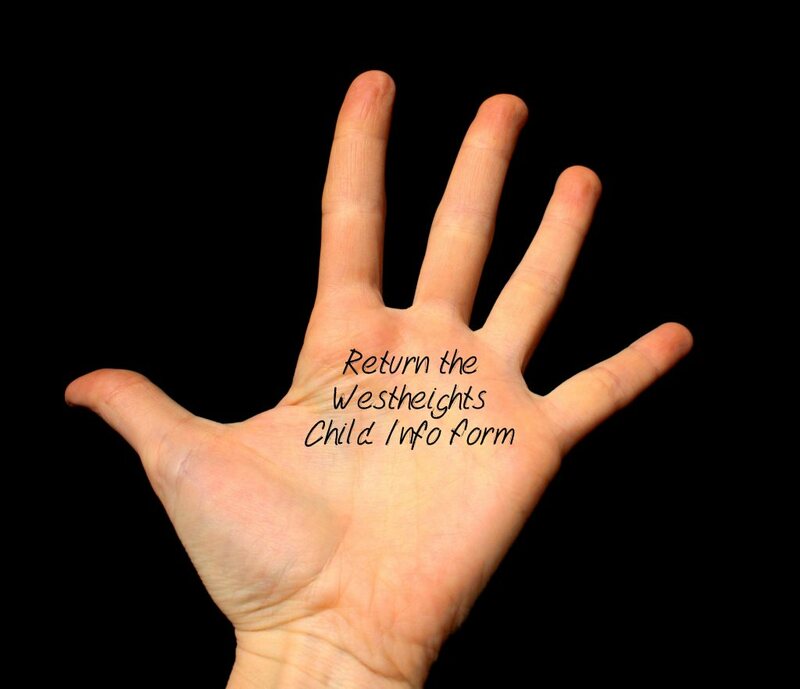 Write a note on your hand in permanent marker so you won’t forget to return the forms!